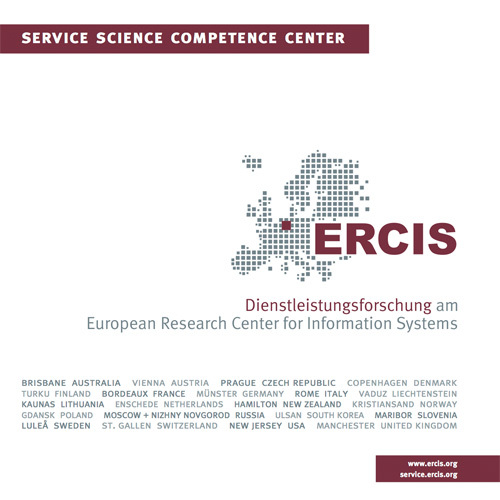 Teaching | Page 2 | ERCIS Competence Center "Service Science"
The Service Science Competence Center frequently offers lectures, workshops and project seminars for Bachelor and Master students in Information Systems. The bachelor project seminar ServDEA was conducted to design a software tool with which performance analysts can design a productivity model based on the Data Envelopment Analysis (DEA). The DEA enables the software to compare several decision units concerning their efficiency to transform inputs in outputs. The elective module 'Hybrid Value Networks' worked on specific challenges of integrating processes of manufacturing companies and service companies in the area of product-service systems. The lecture contented findings of current ERCIS research projects. The seminar included case studies of practical experiences in modeling product-service systems with the FlexNet Architect. A focal area was to model and analyze service networks in the construction industry. The lecture introduced core concepts of the field and included the study of hands-on research results of the research projects FlexNet and ServPay. The seminar part was focused on a detailed analysis of the research results of several publicly funded research projects in the field. Research outcomes of these projects were collected, summarized and entered into an Internet-based research portal. The diploma project seminar H2 ServPay was given the task to develop an consulting approach and a consulting toolset that includes the research results of the research projects ServPay and FlexNet. It developed an early prototype of a software tool that allows for the organizational design of the cooperation in hybrid value creation networks. The tool particularly allows for the definition of templates, which reflect reference content that was elaborated in the research project FlexNet. The project seminar was supported by the Münster based consulting company Schulte, Bender & Partner. Related to the project ServPay, the seminar developed a method for the step-wisely modelling, configuration, and pricing of hybrid value bundles. The precise recommendations made by the method allow for systematic marketing of such value bundles. The seminar was organized by Ralf Knackstedt, Daniel Beverungen, Martin Matzner, and Jens Pöppelbuß. The 16 FlexNet project seminar participants and several application partners designed web services to integrate production and services (product-service systems) and further developed these services with experts of science and practice in standardization workshops organized by the German Institute for Standardization (DIN). The standardized information objects were implemented into software prototypes that implement a product-service system scenario for each of the corporate partners involved in the FlexNet project. In particular, the information objects served to integrate data that were stored in disparate applications, such as the Enterprise Resource Systems SAP and PSI penta. The elective module 'Product-Service Systems' was offered in the Bachelors program. The lecture included basic concepts and case studies as analyzed in the research projects FlexNet and ServPay. The seminar focused standards for IT-based information exchange, modeling methods, empirical studies, performance configuration and market places in the area of product-service systems. The project seminar had the task to extend H2 toolset so that it would allow for an outcome and process oriented controlling of the modelling process. This task comprised of several facets: including the support of mechanism for achieving a consensus amongst modelers; allowing for distributed and web-based modelling as well as using the toolset for modelling of value bundles that comprise of physical products and services. The seminar was supervised by Daniel Beverungen, Stefan Fleischer, Ralf Knackstedt, Lukasz Lis, Oliver Müller und Armin Stein.